Old map by MITELLI - [Il mondo a pezzi - Europa]. Title: [Il mondo a pezzi - Europa]. Size: 7.4 x 9.0 inches. Condition: Wide margins. In good condition. 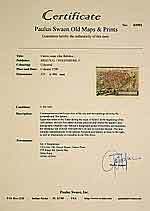 Size of the sheet 290mm x 418mm. Small repair of a teared off piece in lower left margin. Dark impression. Satirical representation of the division of the world by the main European powers. 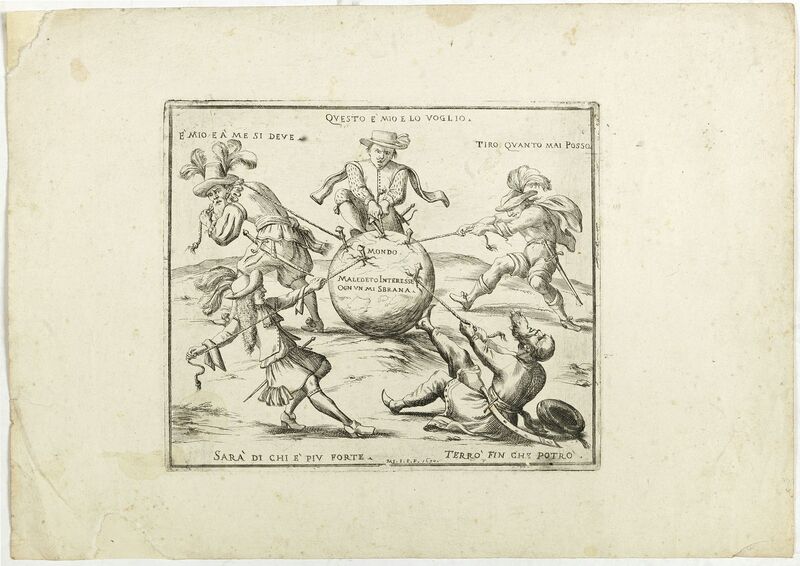 At the center of the scene a globe on which is written "MONDO Maledeto Interesse Ognum Sbrana" sourrounded by five men, Great Britain, Spain, Germany, Turkey and France, all pulling at ropes getting the world for each of them. Very rare broad sheet that is part of the last artistic production decade of the seventeenth century, period in which Giuseppe Maria Mitelli dedicated some of his works to the conflicts between the European monarchies. Giuseppe Maria Mitelli (Bologna (?) 1634–1718 Bologna) was an Italian engraver and painter of the Baroque period. He was active in Bologna who – on top of making wonderful copies of masterpieces by Paolo Veronese, Annibale and Ludovico Carracci, Guido Reni, Titian and Tintoretto – in the 1680s started to make a series of etchings dedicated to “Games” based on dice, as well as “Months”, “Senses”, “Seasons” and “Parcae”. At the end of the 17th century he made like this one engravings related to the conflicts between the European monarchies.